The semitone, also known as the half step, is the basic unit of measurement in Western music. (Western music means music based on European traditions, including all the styles we’re most familiar with like pop, rock, jazz, classical, etc.) Getting a handle on this topic will solidify our knowledge of the piano keyboard. It is also a crucial aspect of understanding how contemporary music works. So let’s get right to it! We already know that pitch refers how high or low a note sounds. 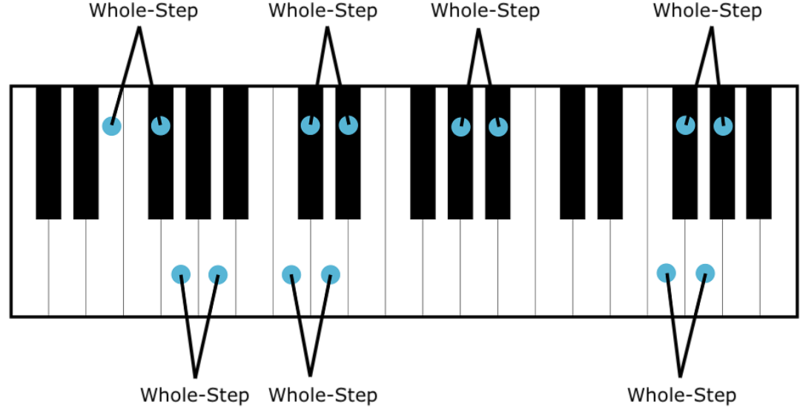 Each note on the piano is higher in pitch than the note on its left, and lower than the note on its right. But how do we measure the distance in pitch from one note to another? The distance between any two neighboring notes on the piano is called a semitone, or half-step. Each and every note on the piano is a semitone away from the note immediately next to it, whether white or black. When we look at a piano, this may not be so immediately obvious. Each note has the exact same distance (in pitch) from the next. For example, there is the same distance from a B note to the C next to it, as there is from a C note to the black note next to it. An octave contains 12 unique notes. Each of these twelve notes is a semitone away from the next closest note. If we start on any note and go up or down by twelve half-steps, we reach the octave of the note we started with (which, as we learned, sounds very similar to the starting note, except it is higher or lower sounding). There is really no difference at all between white notes and black notes on a piano. Black keys sound exactly the same as the white keys, and they are the same distance from each adjacent note as a white note is (a semitone). If one hears a note being played on a piano (without looking), there is no way to tell if they are hearing a black note or a white note. Literally, all notes on the piano are the same. If so, you might be wondering, why in the world did they decide to make some of the notes white and some of the notes black? Wouldn’t it be easier to make all the notes the same color? The more we learn about music theory, including scales, chords, and more, the more our appreciation for the piano keyboard’s unique layout will increase. Everything about it was designed to make things easier for us. The whole step, or whole tone, is simply twice the size of a half-step. How do we measure this on a piano? So, to review, every note on the piano is a half-step away from the next. Any two notes is a whole step. We can measure any music using the semitone as our basic unit of measurement. Let’s practice some musical measuring, and we’ll quickly get the hang of it. Say we start on middle C (C4), and we want to measure the distance from there to F4. All we need to do is count every note up from C (not including C, of course), including black notes, until we reach F.
Let’s try another example, this time starting on B. What note is 5 semitones higher than B3? We can see that there is the same musical distance from B up to E as there is from C up to F.
Now that we know how to count semitones, we have the tool to measure any notes the right way. 1) This pdf worksheet takes you through a thorough workout on the material we covered in this lesson. 2) Practice counting half steps and whole steps, either on a piano keyboard, a keyboard diagram, or any app that has a keyboard. Spend just a couple minutes working out with it, counting half-steps and whole steps upward and downward from any given note, and you will quickly get the hang of it.